Mother's Day tends to bring out the fromage in all of us. Sure, tastefully boring flower arrangements, dutiful boxes of chocolates and sappy greeting cards overrun with bad poetry land you in the safe zone. But if you want to make your mom weep over your certifiable badassery, we're thinking about a different type of message. Something that simultaneously conveys your affection and inclination for brass knuckles and bourbon shots. Something a little more...permanent. 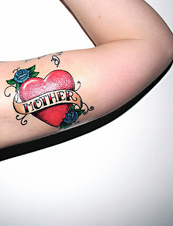 Introducing legendary tattoo artist Scott Campbell's Mother's Day Tattoos at the Smile, a set of unimpeachable manly insignia specially designed—and available for this weekend only—to express your devotion to the woman who brought you into the world. In other words, it's your last, best shot at a Mother's Day present that doesn't involve a stuffed animal. The five designs range from elaborately Victorian cursive script to the classic heart, but they're all sweet enough to impress your mother, and rough enough to get you cred the next time the Hell's Angels pass through town. And if you've been looking for a way to circumvent the Campbell waiting list and sticker shock (these Mother's Day bad boys are only $100), this may be your best shot. And if mom doesn't like it, there's always... Wait, no, you're screwed.